Testing of the F-35 diverterless supersonic inlet on an F-16 testbed. The original intake is shown in the top image. A diverterless supersonic inlet (DSI) is a type of jet engine air intake used by some modern combat aircraft to control air flow into their engines. It consists of a "bump" and a forward-swept inlet cowl, which work together to divert boundary layer airflow away from the aircraft's engine. This eliminates the need for a splitter plate, while compressing the air to slow it down from supersonic to subsonic speeds. The DSI can be used to replace conventional methods of controlling supersonic and boundary-layer airflow. DSIs can be used to replace the intake ramp and inlet cone, which are more complex, heavy and expensive. When an aircraft is flying, the speed of the air relative to the engine is equal to the plane's flight speed. However, current turbine engines are unable to handle supersonic airflow. This is because shock waves associated with supersonic speeds can damage or cause dangerous vibrations in turbine blades, resulting in loss of thrust or engine failure. Consequently, in aircraft travelling at supersonic speeds, the air entering the inlet must be slowed down to subsonic speeds before reaching the compressor and turbine blades of the jet engine. Additionally, the airflow must also be at the optimal speed and volume so as to offer maximum thrust. Modern combat aircraft accomplish this in a variety of ways, through design of the inlet. The inlet sits upstream of the compressor and has a strong influence on engine net thrust. A well-designed inlet straightens out the flow, and feeds the compressor with low-turbulence air at a relatively constant speed and volume. This is not difficult to achieve in subsonic aircraft such as passenger jets, which do not perform high-speed, high-G maneuvers that lead to turbulent airflow. Inlets on subsonic aircraft are simple and shorter, and are basically an opening designed to minimize drag. On supersonic military jets, the inlets are usually much more complex and use shock waves to slow down the air, and movable internal vanes to shape and control the flow. Supersonic flight speeds form shock waves in the intake system and reduce the recovered pressure at the compressor, so some supersonic intakes use devices, such as a cone or ramp, to increase pressure recovery by making more efficient use of the shock waves. The complexity of these inlets increases with an increase in top speed. Planes with top speeds over Mach 2 require much more elaborate inlet designs. This limits most modern combat aircraft to top speeds of Mach 1.8-2.0. The DSI bump functions as a compression surface and creates a pressure distribution that prevents the majority of the boundary layer air from entering the inlet at speeds up to Mach 2. In essence, the DSI does away with complex and heavy mechanical systems. Initial research into the DSI was done by Lockheed Martin in the early 1990s. The first Lockheed DSI was flown on 11 December 1996 as part of a Technology Demonstration project. It was installed on an F-16 Block 30 fighter, replacing aircraft's original intake diverter. 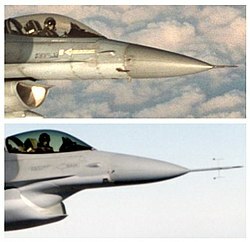 The modified F-16 demonstrated a maximum speed of Mach 2.0 (Mach 2.0 is the F-16's clean certified maximum speed) and handling characteristics similar to a normal F-16. It was also shown that subsonic specific excess power was slightly improved. The DSI concept was introduced into the JAST/JSF program as a trade study item in mid-1994. It was compared with a traditional "caret" style inlet. The trade studies involved additional CFD, testing, and weight and cost analyses. A DSI was later incorporated into the design of the Lockheed Martin F-35 Lightning II after proving to be 30% lighter and showing lower production and maintenance costs over traditional inlets while still meeting all performance requirements. 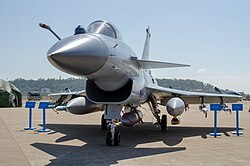 DSIs also crucially improve the aircraft's very-low-observable characteristics (by eliminating radar reflections between the diverter and the aircraft's skin). Additionally, the "bump" surface reduces the engine's exposure to radar, significantly reducing a strong source of radar reflection because they provide an additional shielding of engine fans against radar waves. Analysts have noted that the DSI reduces the need for application of radar-absorbent materials. ^ a b c d Hehs, Eric (15 July 2000). "JSF Diverterless Supersonic Inlet". Code One magazine. Lockheed Martin. Retrieved 11 February 2011. ^ Inlet Design and Inlet types, NASA. ^ "JL-9 Trainer Jet gets DSI inlet, Guizhou China". AirForceWorld.com. Retrieved 29 Aug 2011. ^ "Paris Air Show 2011 - Naval air trainer unveiled by Chinese media". home.janes.com, 15 February 2012. This page was last edited on 10 March 2019, at 02:03 (UTC).